I have written a couple of articles about the new tax bill and how the success of the bill will depend greatly on how much cash is repatriated and how the cash is then used once it is brought back to the United States. Thanks to a few announcements and a survey, we are starting to get an idea of corporate intentions. Before I go one, I want to point out something. After one of my recent articles, a reader accused me of being “anti Trump and anti-republican”. I am politically agnostic and in fact used to own the domain name politicallyagnostic.com before selling it for a profit. I am a true Centrist in that I am split on the main issues that seem to divide the two parties. And if there were a Democrat in the White House, I would have written the same article with the same tone. With that being said, I try to look at the information as an Economist and market analyst since these are the fields I studied in school and have been working at for more than half my life. 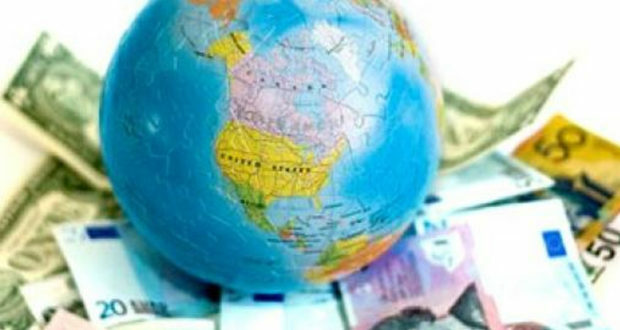 It is my opinion as an economist that in order for the cuts in both corporate and personal taxes to be worth the debt that will be incurred, not only does a great deal of overseas cash have to be repatriated, but it also has to be used in certain ways to get the boost to the economy that will offset the debt. One company that is unlikely to make any changes to its tax structure is Caterpillar (NYSE: CAT). The heavy equipment manufacturer has a division set up in Switzerland for the purpose of selling parts through the subsidiary called Caterpillar SARL. Federal authorities have questioned the structure and legality of the subsidiary and agents raided Caterpillar headquarters back in March. That legal battle is ongoing. Even after the new tax structure and a drop in the maximum corporate rate to 21 percent here in the states, why would Caterpillar change when the company has paid an effective tax rate as low as four percent on billions of dollars of profits through the Swiss subsidiary. A recent Wall Street Journal article quoted Elise Bean, who oversaw a Senate subcommittee’s investigation of the Swiss subsidiary. “The tax bill won’t cause Caterpillar to close up shop in Switzerland, just the opposite,” she says. Caterpillar itself has not made any statements about their intentions, but simply said that the tax changes would help American manufacturers compete in foreign countries and gain more access to cash there. I can see a potential deal being worked out between the IRS and Caterpillar where the company agrees to repatriate a portion of their overseas cash holdings and pays the one-time lower tax on those assets. In return the IRS forgives a possible $2 billion tax bill if the structure of the Swiss unit is declared inappropriately structured or has been inappropriately used for the purpose of avoiding taxes. Perhaps the more informative piece of news was the results of a survey by Bank of America Merrill Lynch with results from 302 companies. 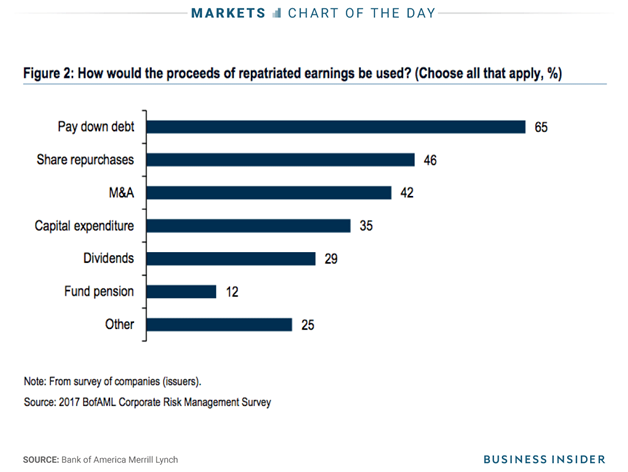 When asked how the proceeds of repatriated earnings would be uses, the most common answer was to pay down debt. That was the only response that was greater than 50 percent. Other responses with considerable totals were share repurchases, mergers and acquisitions, capital expenditures, and dividends. Over the last ten years, corporate debt issuance has risen every year except 2011 and hit a record in 2017. So having corporations use the repatriated earnings to pay down debt wouldn’t be a bad thing and would make companies stronger over the long haul. “The only reason why a lot of these companies issued so much debt was that they could not touch the overseas cash – when they now gain access to this cash, it makes sense to use some of it to take out the debt,” Bank of America Merrill Lynch wrote in a recent note. Looking at each of the other uses that ranked high and how they might benefit the economy, share buybacks and dividends will benefit investors over the long haul. Capital expenditures would provide the biggest benefit as they would increase corporate spending and that would have a domino effect as one company spending to build a new plant or upgrading equipment would require the goods and services of other companies. All of which would likely require more labor. Mergers and acquisitions would not really have a benefit for the overall economy because when two entities merge they tend to combine workforces and equipment and eliminate overlapping personnel and departments. Mergers and acquisitions generate fee income for investment banks, but tend to lead to contraction in labor and spending, not exactly what we need the tax bill to do. The only other two uses listed in the table above are funding pensions and other. Other is where you would find things like charitable donations like those announced by Boeing and Southwest Airlines. You would also find employee bonuses in this category. Employee bonuses and pay increases would likely have the most immediate impact on the economy as a whole as workers tend to spend new-found money. This spending would also have a domino effect, unfortunately it seems to be one of the least planned uses for the money. Funding pensions will benefit workers down the road, but once again I don’t think that is what Republicans had in mind when they made the cuts. It will likely take years to see what impact the tax bill has on the economy as a whole, but the way it stands now with the intended uses, it looks like most corporations have longer-term goals in mind. While that might not be what President Trump and Republican leaders had in mind, it might not be the worst thing. If too many companies repatriated too much cash and doled it out to employees, it could cause the economy to overheat. A slow positive impact with long-term declines in corporate debt-to-income ratios could be the best possible outcome. In view of the fact that annual Federal revenue almost always goes up year-over-year whether taxes are raised, lowered or left alone, it is disingenuous to claim that a “tax cut” has to be “paid for” by reduced spending (or repatriated funds). Read a few of Daniel J. Mitchell’s columns to see how several countries have reduced deficits and occasionally even their debt by just keeping increases in spending smaller than increased revenue. ‘Would You Like a Whole Company With That?’ Whole Business Securitization of Restaurant Companies.